Timothy Cook is an artist from Melville Island, Northern Territory, who paints through the Jilamara Arts and Crafts Centre. Cook was born in 1958 on Melville Island, where he has spent his entire life. 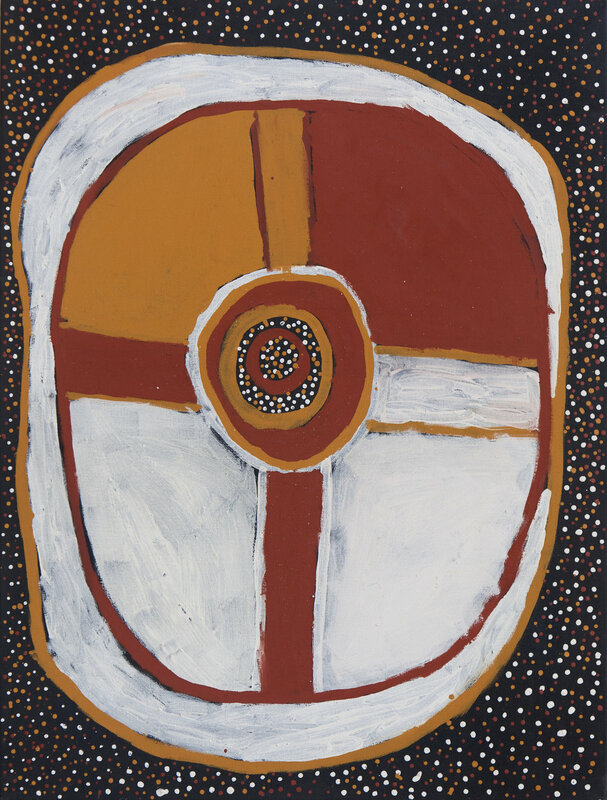 He began painting and carving in the mid 1990s, using designs taught to him by elders, and first exhibited his work in 1997. He lives at Milikapiti and works there in association with Jilamara Arts & Crafts. Depicting alternating horizontal lines of red, white and yellow ocher across the canvas, his paintings take on their own cadence and rhythm. Employing natural ochers against a white ground, in the style championed by the late Kutuwalumi Purawarrumpatu, also known as Kitty Kantilla, Cook has established his place as one of the leading artists of his generation. Cook, like Purawarrumpatu, draws on the distinctive traditions of his ancestors to create contemporary paintings that symbolize the dynamism of Tiwi cultural life and generational continuum of tradition through individual innovation. Cook refers to the body paint designs used in the Pukumani ceremony, the traditional Tiwi funeral ceremony, one of the cornerstones of Tiwi belief. His art is also closely linked to stories of Purrukuparli, the Tiwi ancestor whose cultural legacy is revealed in the geometric patterns, common in all Tiwi art, which often depict sites of stories of ancestral significance. Each Tiwi artist has their own individual interpretation of the designs. The traditional Tiwi ceremony of kulama (or yam) is a recurrent subject in Cook’s work, and its circular motif has several echoes in Tiwi culture. The eponymous ceremony, although rarely practised now, is a coming-of-age ritual coincident with the harvest of the kulama yams in which a circular fire-pit and dancing circle are consistent elements. Performed in the early dry season, ‘Kulama time’ is also indicated by the conspicuous halo that appears around the full moon. The moon is a potent metaphor for life and death in the Tiwi Islands. It is home to the adulterous Tapara from the Tiwi mortuary narrative of Pukumani, which also features Purukapali, his wife Waiyai, and their baby son Jinani.